When the new series of Ashes to Ashes gets under way you will see DCI Gene Hunt reunited with his red Audi Quattro. I should declare an interest: I am DCI Gene Hunt — or at least I play him in the show, at any rate. But, bias aside, I think it’s a cracking opening episode. As the Ford Cortina was integral to the success of Life on Mars so the Audi is to Ashes and it’s in the second episode that the car really gets its first proper workout, against an Austin Princess. It’s a high-octane car chase and the Quattro comes out on top — well, what did you expect? It could be the last time that we use the car, though. Since the end of filming a month or so ago, I have been concerned that the Quattro is getting on a bit: the one we use in the show has 165,000 miles on the clock and therefore we had to draft in an understudy car in case anything went wrong with it. It also sustained some pretty serious damage during filming. The chase with the Princess resulted in a badly scraped wing and during another scene a stunt man fell too heavily on the bonnet and smashed the front windscreen. At least I hope it was a stunt man, not a passing punter watching the filming. In many ways the Quattro has become its own character in the show — like the Batmobile and the Ford Gran Torino in Starsky and Hutch. You know the car has made an impact when you see a white van on the motorway with the words “Fire up the Transit” finger-painted on the side of it. A lot of people say it is unrealistic that Hunt — a 1980s copper — would drive a Quattro. But then a Bay City detective could never have afforded a Gran Torino, but that hasn’t stopped people using one. We have these marvellous two words in our industry called “artistic licence”. One of the perks of this job is that you get to drive cars that you never normally would. The Volante is not the newest Aston — it was first seen back in 2004 — but the version I tested was the 2008 facelifted model featuring an upgraded engine boasting more power, and the Touchtronic 2 automatic gearbox, whatever the hell that is. Much to the embarrassment of my wife, it arrived at my home in west London, chauffeur driven, and emerged from something that looked like a horsebox — all very Bond-like. So I said to the deliveryman: “Ah, you must be Q.” “Actually,” he said, “it’s Duncan.” No matter, the car looked fit for Bond and I decided to call it Ursula — especially when I took the top down. If someone asked me which car I would most want, I would probably say an Aston. The first thing you notice when you get inside is the quality of everything: hand-stitched leather seats, walnut dash and leather steering wheel. The car changes the way you feel about driving, which is the hallmark of a great motor — something that can change how you perceive yourself when you are in it. In my case it felt like I was driving in a wood-panelled drawing room in the Garrick club. So what’s it like to drive? Well, for a start, if you are used to a “normal” car, the first thing you will notice is the sound of the V12 engine. Press the starter button and the six-litre unit fires up with a head-turning roar before settling down to a throbbing tickover. There are valves in the exhaust system that open up at just under 4000rpm to give the 470bhp engine its full voice, something that makes Pavarotti in his heyday sound like he’s got a sore throat. For those of you still awake, I nicked the information about the valves from the press pack because it sounds impressive. But dab the throttle and immediately you realise the rate of acceleration is phenomenal, especially for a car that weighs 1½ tons. There is no gearlever; instead you press a couple of buttons for forward or reverse - the automatic box does the rest. There are also two paddles mounted on the steering wheel. Now, I have these things in my car at home, but I never use them. What's the point? Once you have become a convert to autos you tend to stay with them just for sheer ease of use, especially if, like me, you live in a city. But in the Volante it's different. You want to change the gears; you want to eke out every bit of control you can over the car because - well, where's the fun in driving an Aston if you don't? Call me childish, but dropping a gear to overtake and seeing the rev counter bounce towards the red and hearing the engine emit a howl of approval was a bit tasty. After a weekend with the car - I like to think of it as an extended screen test - I am in no doubt that Gene Hunt would be happy to drive this car. What car could be better suited to his character? An Aston is British, doesn't compromise and, with a fuel economy of 18.2mpg, is just as politically incorrect. The one thing he might not approve of is the colour scheme of this particular model - I wasn't taken by it either. It was a sort of sparkled white that looked like a footballer's wife's nail varnish. Hunt would probably have referred to it as a woofter-mobile. I asked Q (sorry, Duncan) about it and his explanation was almost good enough for me to forgive it. "Well," he said. "One cold morning the company's boss got in his silver Aston to drive to work and he noticed the frost had formed a coat over the paintwork that reflected the sun and sparkled. He called the factory, showed them the car and said, 'I want the new Aston to look like this.' And that's what they did." For me, that is Aston through and through: taking on Mother Nature and coming within an ace of beating it. Sod the bankers: Aston Martin should be running the country. 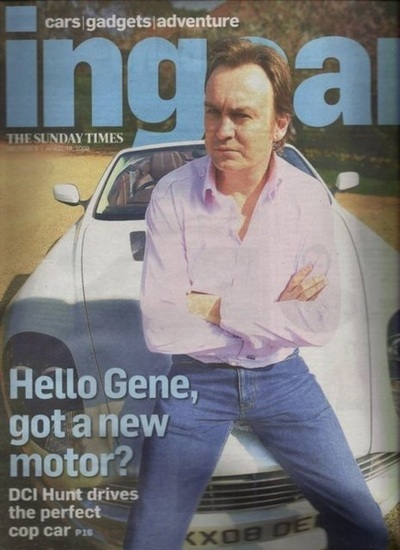 Glenister's verdict: Fire up the Aston!